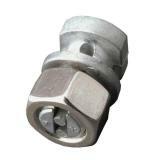 Remove nut and washer. 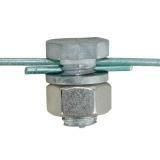 Place split-bolt portion over the wire that is being attached. Place bare end of connecting wire into the slot of split bolt. (If using insulated wire, sold separately, thread off about 2" of insulation.) Repeat as many times as needed for multiple wires. Replace the washer; screw the nut down tight. Do not over-tighten. For electrical connections only, will not take strain. 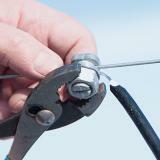 Cuts high-tensile wire with ease. Moderate hands can do it with one hand. Use this tool to hammer, hold staples, remove staples, grip wire or to cut wire (non high-tensile). Perfect for hi tensile connections. Easy to use. Can be finger tight for quick release if you need it.